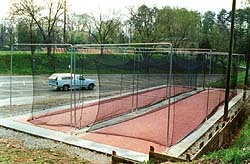 Precision Net Batting Cage Nets, Barrier Nets, Sports Equipment. Our stock cage nets are available in four strengths of netting, #21 for medium duty usage, #24 for regular duty usage, #36 for heavy duty usage, and #42 for extreme usage. All nets are constructed of UV treated, waterproof, knotted polyethylene netting. We sew a rope border around the top, corners, and bottom, and add an extra rope down the center of the top to make the nets easier to hang. All nets are black in color. The sizes listed are in stock and can be shipped the same day the order is placed. We have many more sizes and materials available. Please call for prices on nets not listed. Our nylon batting cage nets are constructed just like our polyethylene cage nets with the difference being they are made of UV treated, knotted nylon netting. Please call for prices on sizes not listed. We also make these nets of #42 nylon and #60 nylon. Please call for prices.